So last Saturday I finally put procrastination to the side and decided to water my flower bed. The rain had stopped for a few days and I wanted to take advantage of the beautiful weather and get yard work done. I walk over to the bed with my water hose in tow when out of nowhere I see some gray fuzzy critters scurry underneath my doorstep and into the ground….I slowly put the water hose down and dashed back into the house for safety! What the heck was that? I’ve been in my home for about a year and a half now. There are definitely animals in the area, but I’ve never encountered any of them at such a close range. After much research and visits to my local Home Depot, I discovered my yard had a case of the groundhogs….cute, but very destructive. If they had picked any other spot in my yard I would’ve been fine with it because they’re quiet and they go about their business. But they were right next to the foundation of my house and were having a serious digging party. Keep in mind they’re notorious for digging to the point where a structure’s foundation could be destroyed if they’re not managed. Not my house – no way. Wrong address, woodchucks! My poor flowers! Right when they were budding, the tips were snatched by the villans! Of course the internet is filled with crazy remedies to that claim to run them off your property. Chicken wire, moth balls, rosemary oil, poisoned worms, radios (! ), bombs…you name it, it supposedly resolves your groundhog problem. To be honest, I tried the more “sensible” theories; I brought ammonia and poured some in the hole and then splashed some around the front of my house Why? Because ammonia smells like pee, and they don’t like the smell of anyone else’s, so they relocate to another spot. Well, it didn’t work, in fact, I saw an extra member join the posse over the next few days! 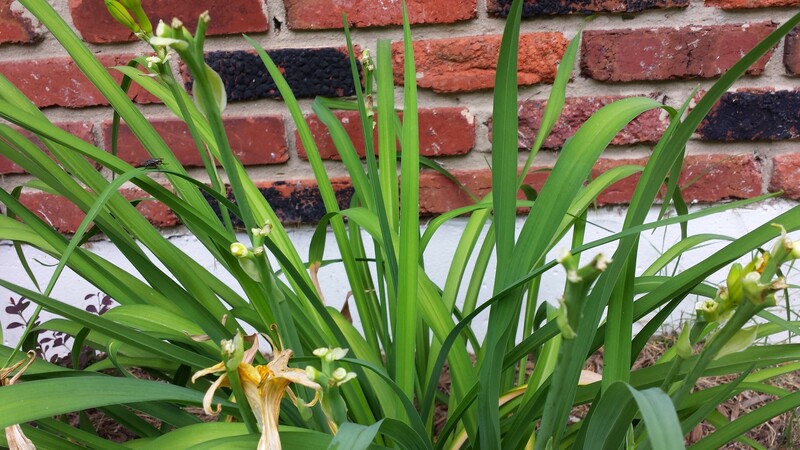 Meanwhile, the flower buds are being destroyed, droppings are all over my yard and the hole seems to get bigger. This is the hole they dug out. 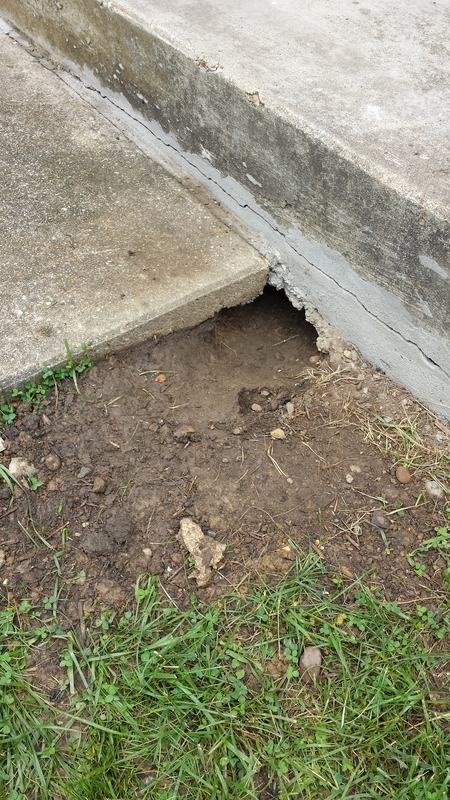 Fortunately it’s only one hole, they didn’t create underground condos like other groundhogs do. When I realized none of the alternative options would be effective, I finally resorted to the most effective way to keep them from clawing at my foundation; I hired an animal control expert to trap and remove them from my yard. Bait was laid out and the trap was set. It didn’t take long, two of them were caught within a matter of 2 hours. I love animals, but I won’t take the chance of having my foundation tampered with. They had to go! One of the two villans that were caught. Needless to say, he was not a happy camper! To finally answer the question, there is something I would change from this past week. 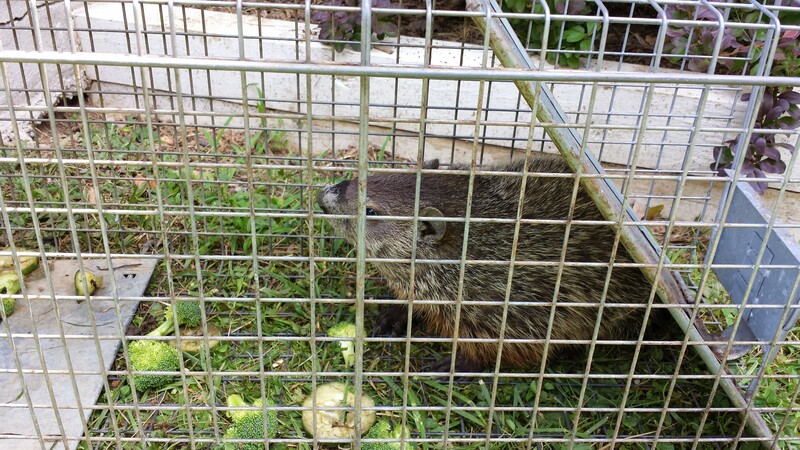 Because it was a first time situation, I was really worried about handling the groundhogs properly, so I hired a company to come out and set traps and relocate them. Come to find out, it’s something I could’ve done myself for a fraction of what I had to pay. Instead, I was turned off about stories of them becoming violent and defecating in your car as you transport them to a safer spot. I could’ve dealt with all of that without anyone getting hurt. It goes to show me that I don’t need to face situations with so much fear. I could’ve taken the bull by its horns…or in this case the woodchuck by it’s love for veggies. A good learning lesson for me. Next time, I won’t be so fearful. Even if I known that they were harmless I still would’ve hired somebody to do it. So would I. You just never know, so better to be safe than sorry. Glad it was all sorted out and you can claim back your yard now. I’m still on the look out to see if any more decided to hang around. We caught two babies, so I don’t know if the mother is around or if she orphaned them. I also need to find a way to keep that hole sealed that other animals don’t come around and try to claim a new home!